My man T.S. Eliot sure got it right when it comes to the Modern-Era NFL’s 12-month “season.” Leading up to the 2009 NFL Draft on April 25-26th, April is an agonizing month for those of us starving for NFL content. So without much going on in the league besides checking on the latest Bengals player to make the police blotter, we are forced to subject ourselves to near endless blather about Mock Drafts and everyone’s draft board, which in the end amount to little more than pure conjecture and quite frankly, outright blind-guessing when it comes to the near-impossible task of predicting which college players will land on our favorite NFL teams. Cold Hard Football Facts has a great article about how even the Mock Draft “Experts,” guys who make a living using their expertise to divine the minds of 32 GM’s, literally have no clue as to how teams will ultimately pick on draft day. To prove his point, the writer goes back to previous drafts to examine how the most notable mocks stacked up against reality. Verdict: an average of 19.9% accuracy. So instead of weighing in on whom I think the Redskins will pick, only to virtually guarantee looking like an idiot (although I just gotta say I have get a good feeling about USC LB Clay Matthews, whether the Skins pick him or not), I instead decided to have a look at the Washington Redskins Draft history and attempted to rank order our most successful picks since 1990. Without further ado, here’s the list, rank-ordered, starting with #10. 10. Rock Cartwright, Special Teams. 257th Overall Pick, Kansas State, 2002. While technically a running back, and a rather unremarkable one at that, Rock secured his legacy in Redskins lore as being one of the most effective kick return men since Brian Mitchell. 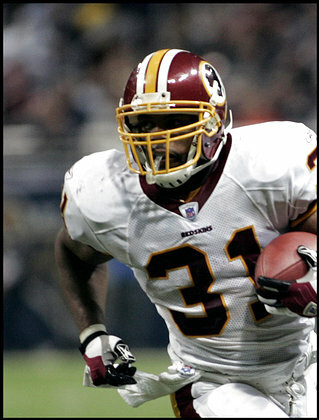 In 2007 he broke the Skins’ single-season kickoff return record with 1541 yards (an amazing 24 yards per return). Rock is just that, a Rock, and I hope to see him remain in a Redskins uniform until he decides to hang it up. 9. Sean Taylor, S. 5th Overall Pick, Miami, 2004. It’s hard to be objective about this particular player, as there is so much emotion surrounding his untimely demise. There is no doubt that Taylor possessed freakish physical talent, built a reputation as one of the most feared defenders in the game, and was in the midst of his best NFL season when he was murdered. He earned two Pro Bowl selections in his short NFL career, one as an alternate, and another posthumously (though deservedly) after the 2007 season, but no one can deny that his career, especially his early days, were marred by controversy and inconsistency. Had he lived, it’s a lock that he would be ranked higher on this list in terms of his Redskins legacy, and would likely be considered one of the best at his position in the entire league. 8. Fred Smoot, CB. 45th Overall Pick, Mississippi State, 2001. It almost feels funny putting Smoot ahead of Taylor on this list, but the fact remains that from a career perspective, while he has no Pro Bowl selections to his credit, Smoot has delivered more consistent play for the Redskins’ defensive backfield since his rookie season (save two years playing for the Minnesota Vikings in 2005 & 2006). 7. Champ Bailey, CB. 7th Overall Pick, Georgia, 1999. Champ checks in at #8 on this list due to the fact that the bulk of his NFL accomplishments have occurred not in a Washington uniform. Had he remained in DC, he would definitely log in near the top of this list. Traded away following the 2003 season to the Denver Broncos for Clinton Portis, Champ is an eight-time Pro Bowler and a three-time All Pro. 6. Ladell Betts, RB, 56th Overall Pick, Iowa 2002. Quietly, Ladell Betts has proven himself to be one of the NFL’s most consistent and reliable 2nd string running backs. In 2006 he filled in for an injured Clinton Portis, flying through the gaps for 4.7 yards a pop, logging 1154 rushing yards. Ranking #11 on the Redskins’ all-time rushing list, Betts is a team player an asset to any offense, providing in-game relief to the #1 guy, combined with the ability to step up and start when needed. He is the only player in Redskins history to log back-to-back 150+ rushing performances. 5. Stephen Davis, RB. 102nd Overall Pick, Auburn, 1996. Holding the #3 and #4 spots in the Redskins’ franchise record book for single-season rushing yards (1432 in 2001 and 1405 in 1999), Davis was a big, powerful back in the model of John Riggins, whom Joe Gibbs would have loved. While the end of his career was injury-plagued, Davis earned two Pro Bowl selections in the Burgundy and Gold and another one playing for the Carolina Panthers. 4. Chris Cooley, TE. 81st Overall Pick, Utah State, 2004. There’s not much to dislike about “Captain Chaos.” A fan favorite, Cooley has provided consistent and sometimes stellar play at the tight end position. A two-time Pro Bowler (plus one Alternate Selection in 2006), Chris seems to embody the team concept and is in many ways the face of the Redskins franchise. Provided he remains on the roster and continues to deliver consistent play, he will no doubt move up on this list and cement his place as the greatest Redskins tight end ever. 3. Jon Jansen, OT. 37th Overall Pick, Michigan, 1999. 2. Chris Samuels, OT. 3rd Overall Pick, Alabama, 2000. It’s no coincidence that the second-leading rusher in Redskins history and the Redskins record holder for most rushing yards in a single season (Clinton Portis, 1516 yards), has had some of his biggest days running behind these two stalwarts of the offensive line. The fact that Portis could likely surpass John Riggins as the all-time franchise rushing leader sometime during the 2009 season is a testament to the reliability and consistency of these two O linemen who embody the grit and strength of the Hogs of legend. 1. Brian Mitchell, Special Teams, 130th Overall Pick, Lousiana-Lafayette, 1990. Named one of the 70 Greatest Redskins, Brian Mitchell is not only a legendary Redskin, but is arguably the greatest special teamer to ever play the game. The only player on this list with a Superbowl ring, Mitchell is the holder of 7 NFL Records and logged over 20,000 combined kickoff and punt return yards! Brian Mitchell was a can-do player who provided the winning edge during some of the Skins better years, even filling in at the quarterback position (like Randel El, he played QB in college) during the infamous Monday Night “Body Bag Game.” A true “Mr. Redskin,” Mitchell re-signed with the Skins for one day in 2004 after playing a few seasons for other NFC East teams so that he could retire as a Redskin. Desmond Howard, WR/Special Teams, 4th Overall Pick, Michigan, 1992. Frank Wycheck, TE. 160th Overall Pick, Maryland, 1993. Keenan McCardell, WR. 326th Overall Pick, UNLV, 1991. While these players did little wearing the Burgundy and Gold, they all went on to have extremely productive careers for other franchises (McCardell ultimately finished his career as a Redskin for one season in 2007). Desmond Howard is the closest to a certifiable draft-bust in this bunch, but went on to win Superbowl MVP honors while playing for the Packers as a special teamer. I only mention these three because they were ultimately very solid draft choices that for one reason or another were unproductive as Redskins and unfortunately paid their dividends to other franchises. If only Redskins coaches were better able to better utilize their talents, the late 90’s might have been a bit prettier. Fred Smoot above Sean Taylor? No Darrell Green? Thanks for weighing in. On the issue of Darrell Green: he’s not on this list because we’re only going back as far as 1990. Darrell Green was drafted in 1983. As far as Sean Taylor vs. Fred Smoot: it was a tough choice, but we ultimately made the decision based on overall career contribution. Listen – Sean Taylor’s the man and was in the midst of his best professional season when he was taken from us, but his Redskins legacy is comparatively short, just 3 1/2 seasons, with the first two seasons being relatively inconsistent. While Fred is not a fearsome force to be reckoned with like Sean, he’s provided quality and consistent play for the Skins for six seasons and has turned out by just about any measure to be a very successful draft pick for the B&G.